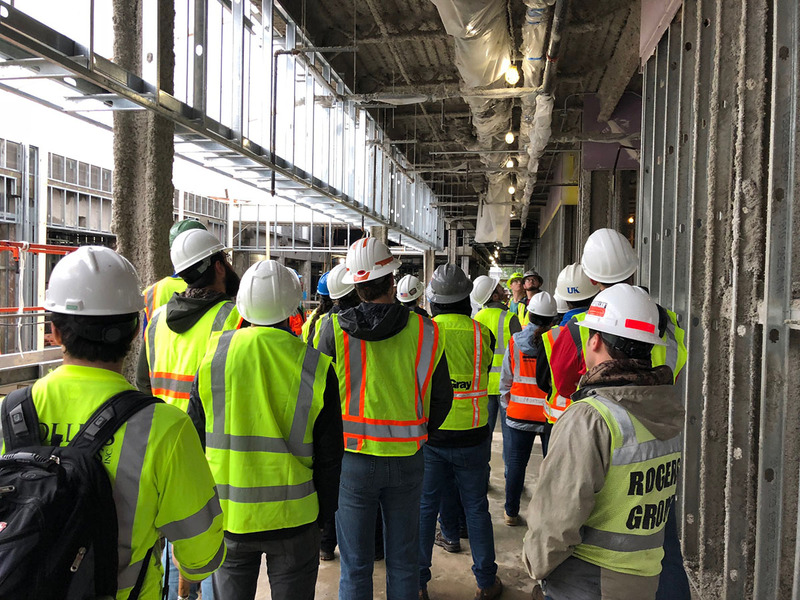 On October 15, civil engineering assistant professor Gabriel Dadi and his CE508 class endured a steady onslaught of rain and took a site visit to the UK College of Law building currently under construction. The course is a senior level elective in the area of construction engineering and project management that focuses on construction methods. The hosts for the tour were Cole Combs (BSCE ’02) and Kaleb Lancaster (BSCE ’18) from Congleton-Hacker. They discussed the challenging logistics of storing material and moving heavy equipment on a crowded project flanked by campus buildings and a busy street with overhead powerlines, as well as various challenges with phasing the construction work and plenty of neat features about the final design. Congleton-Hacker has been a huge supporter of the UK construction program in civil engineering, led primarily by their president and CEO, Mr. Larry Cowgill.